2016 was a year marked with accomplishments, successes, losses and failures for the Greek American Community. One great loss was the death of the Vice Chairman of the Archdiocesan Council Mike Jaharis, a successful businessman and philanthropist. A negative event was the failure to succeed commitments from the new President of the United States, Donald Trump on issues of concern to the Greek Americans. A positive development is the selection by Trump of Greek American Reince Priebus as his White House Chief of Staff. Four Greek Americans were elected in Congress. The departing of Vice President Joe Biden from the White House on January 20, leaves Greek Americans in vacuum, because he was always a stong voice of support for Cyprus, Greece and the Ecumenical Patriarchate. On the positive side, in 2016 the organizations involved in the promotion of our Greek National issues continued pushing for a more effective U.S. policy in Cyprus. Hellenic American Leadership Council (HALC) gets stronger in the younger generation of Greek Americans, promoting greater involvement in politics and lobby for the Hellenic Issues in Washington, in Coordination with the Jewish Lobby, the Armenians etc. Businessman Steve Valiotis made an impressive $10 million donation to the St Michael’s Home for the Aged, setting a new record and an example for others to follow. Archbishop Demetrios blessed the waters in Tarpon Springs, Florida, on January 6, during he 110th annual Epiphany festivities. It is he largest celebration of its kind in the Western Hemisphere. Epiphany is a Christian ceremony that celebrates the baptism of Jesus Christ by John the Baptist in the Jordan River. Prominent Greek Americans from New York, New Jersey, Illinois and Washington DC participated in the first fundraising for Hillary 2016 in the tri-state area. Wealthy businessman Dennis Mehiel, a Democratic candidate for lieutenant governor and a close supporter of every Hillary Clinton campaign, was coordinating the $2,700 per plate event. John Podesta, chairman of Hillary’s national presidential campaign and a Greek American, Andy Manatos etc were among the people attended. During the presidential election campaign the majority of Greek Americans supported Hillary Clinton. Mike Jaharis, an entrepreneur, philanthropist, humanitarian and distinguished member of the Hellenic American and Greek Orthodox community, passed away peacefully on February 17, 2016, in his home with his family by his side. He was 87 years old. Archbishop Demetrios of America presided over the funeral service at the Holy Trinity Cathedral in NYC, on Saturday. The 25th Annual Leadership 100 Conference took place from February 18 to 21, 2016 at The Phoenician in Scottsdale, Arizona. It began with a Trisagion Service on Thursday, February 18, conducted by His Eminence Metropolitan Gerasimos of San Francisco in memory of Michael E. Jaharis, a Founder of Leadership 100, Vice President of the Archdiocesan Council and leading businessman and philanthropist who passed away in the Lord on February 17. The Hellenism Forum featured a special presentation on the Benaki Museum by Pavlos Yeroulanos, who served as Greece’s Minister for Culture and Tourism, and included two rooms of Exhibits from the Benaki Museum, a prelude to a tour of the United States. Leaders of the Greek American and Jewish American Communities, along with 25 members of Congress and the Ambassadors of Greece, Israel and Cyprus, gathered on Thursday, February 25 on Capitol Hill, in celebration of the third anniversary of the Congressional Hellenic-Israel Alliance (CHIA). A congressional caucus designed to raise awareness of the importance of the trilateral relationship among Greece, Cyprus, and Israel, which has yielded important political and national security benefits for the U.S. and the region and encourage for the U.S support for its goals. The anniversary reception, jointly sponsored by AJC and HALC and it was the conclusion of a 24-hour long joint advocate activity from members of both the Hellenic American Leadership Council (HALC) and the American Jewish Committee (AJC). These 40 years of struggle for Cyprus and continuous effort for the Cypriot Community in the United States of the Pancyprian Association was celebrated on Wednesday, March 9, 2016, at 6 pm, with a gala dinner at the New York Hilton Midtown (1335 Avenue of the Americas New York, NY 10019). The organization honored with the “Lifetime Achievement Award” one of its founding members, Constantine (Dinos) Iordanou, Chairman of the Board of Arch Capital. President Barack Obama hosted on April 4, t the White House, the Annual Greek Independence Day celebration and reception for the 30th consecutive year, honoring the 195th Anniversary of the start of the Greek War for Independence of March 25th, 1821. His Eminence Archbishop Demetrios of America, Vice-President Joe Biden and President Barack Obama spoke at the ceremony that took place in the East Room of the White House and was attended by approximately 400 guests representing the Greek-American community. Archbishop Demetrios of America met with the representatives of the Executive Committee of the Pan-Macedonian Association in the United States and discussed with them issues relevant to the national concern of the name of FYROM (Former Yugoslav Republic of Macedonia). As part of their 70th Anniversary celebrations, the Pan-Macedonian Association launched a petition campaign in order to reverse the wrong decision of the American government in 2004 for provisional recognition of the country of FYROM as “Macedonia,” despite the established practice of the United Nations that uses the name FYROM. The 32nd Congress of the International Coordinating Committee “Justice for Cyprus”, (PSEKA) that took place in Washington DC from June 7-9, focused on pushing the U.S. administration to use its influence on Turkey in order to have a solution to the 42 year old Cyprus problem. On June 9, a delegation comprising leading figures from Greeks and Cypriots living in the US will be received by Vice President Joe Biden at the White House. The meeting lasted an hour and it was attended by President of the PSEKA- International Coordinating Committee “Justice for Cyprus,” Philip Christopher, Andy and Mike Manatos from the National Coordinated Effort of Hellenes, President of the Federation of Cypriot American Organizations, Kyriakos Papastylianou, Vice President of PSEKA Panikos Papanikolaou, founder of the Hellenic American Leadership Council (HALC), Nikos Mouyiaris, HALC’s Executive Director Endy Zemenides, and President of the Federation of Hellenic American Associations of New Jersey, Savas Tsivicos. The Hellenic Initiative’s Fourth Annual Gala was a huge success, raising over $2 million to support THI’s programs in Greece, as its chairman Andrew Liveris announced. Over 700 Greek Americans and Philhellenes attended the event at the Waldorf Astoria New York., among them Olympians Stefanidi, Petrounias, Gianniotis and Maroulis. Admiral James Stavrides was the main speaker. The spirit of Antigone, the legendary princess of Thebes and heroine of Sophocles’ tragedy by the same name (written ca 441 BC), who struggles against authority to provide a sanctified burial for the body of her rebel brother, Polyneices, thus becoming a rebel herself, provided a strong framework for “Antigone Now”, the 2016 presentation of the Onassis Cultural Center’s (OCC) new, four-day Festival of Arts and Letters (October 13-16), initiated in 2015 with “Narcissus Now: The Myth Reimagined”. New York State Governor Andrew M. Cuomo received this year’s Athenagoras Human Rights Award presented by the Order of Saint Andrew, Archons of the Ecumenical Patriarchate, at the organization’s annual banquet Saturday, Oct. 15, at the New York Marriott Marquis Hotel in New York City. Governor Cuomo, a strong advocate for religious freedom for the Ecumenical Patriarchate, was the instrumental person in the process of securing an agreement with the Port Authority of New York and New Jersey regarding the rebuilding and resurrection of St. Nicholas Greek Orthodox Church and National Shrine at the World Trade Center, which was destroyed in the terrorist attacks of September 11, 2001. Nitzia Logothetis, founder and interim CEO of the Seleni Institute, a non-for profit organization that cares for women and families, providing mental health care awareness advice, professional training and research funding, was honored a “Person of the Year”, by the Hellenic American Chamber of Commerce, during its 68th Annual Dinner Dance, on October 21st. The President of the Chamber Brian Devine and the Chairman of the Board of directors Nancy Papaioannou presented the award. The net proceeds of the event will be donated to the Hellenic Society for Disabled Children (ELEPAP). Vice President Joe Biden received the Oxi Day Award for Courage, during the gala dinner of the OXI Day Foundation in Washington, on October 28. His son Beau Biden, who died from cancer a year and a half ago and was given the award posthumously. Also honored was Yazidi survivor of ISIS atrocities and sexual slavery, Nobel Peace Prize Nominee and UN Goodwill Ambassador Nadia Murad. Debt relief for Greece will definitely be on the agenda when U.S. President Barack Obama visits Athens in November, Biden told Greek reporters after the ceremony. Four Greek Americans won seats in the U.S. House of Representatives on November 8. In addition to Gus Bilirakis, John Sarbanes and Dina Titus, Charles Crist won a seat in Florida. State Senator Mike Gianaris was re-elected in New York, as well as assembly members Aravella Simotas, Nicole Malliotakis, Frank Skartados and James Skoufis. President elect Donald Trump selected Greek American Reince Priebus as his White House Chief of Staff. The former Chairman of the Republican National Committee played a crucial part in securing a smooth National Convention and the support of the party’s mechanism to the Republican Presidential Candidate. The photo is from the 2012 PSEKA Conference in Washington, during which he was honored. Greek American businessman Steve Valiotis made the largest single donation ever in the history of the Greek Orthodox Archdiocese in American, giving 10 million dollars for the development of the new St Michael’s Home for the Aged in Uniondale Long Island. The announcement was made during the 58th St Michael’s gala dinner, on November 13. The 15th Annual Conference on The Future of Hellenism, held at the Renaissance Newark Airport Hotel in Elizabeth New Jersey on November 18 and 19. Nick Larigakis President, American Hellenic Institute; Zenon Christodoulou, Conference Chairman, Founding Chair of the New Jersey State Hellenic American Heritage Commission; Dr. Spiro Spireas, President, American Hellenic Institute greeted and welcomed guests. PavlosYeroulanos, Former Minister for Culture and Tourism, Board Member, Benaki Museum, gave the Keynote speech, “The Role of Greece in Promoting Hellenism Abroad”. Five panels were held on Saturday, each with a moderator and panelists speaking on these topics: Greek Education in America; Current Perspectives and Current Challenges; The Changing Nature of the Greek American Community; Looking to the Next Generation of Greek Americans. Greek-American businessman of Chian heritage, philanthropist and a major supporter of US/Hellenic and Orthodox causes, Michael Psaros, was the recipient of the 37th Homeric Award of the Chian Federation. On Friday, December 2, in front of 300 participants at the Annual Homeric Award Gala, Michael Psaros made one of the most impressive speeches, touching upon the threats against Greece and the role Greek American Community should play in order to be effective in helping the motherland. 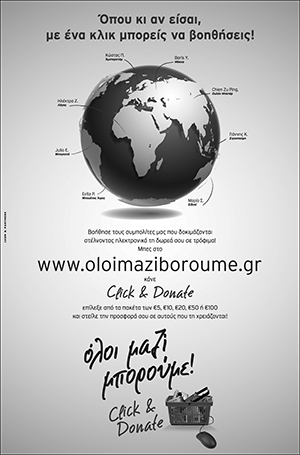 At the same time he announced that along with his wife Robin, they will match any funds raised by the Chian Federation in the U.S. and Canada, up to 100,000 dollars, specifically for medical supplies and pharmaceuticals, to cover needs of the people o Chios. The investment opportunities in Greece were explored during the 18th Annual Capital Link Invest in Greece Forum that took place in New York, on Monday, December 12. The conference concluded with an official dinner in honor of Mr. W. Ross, Secretary of Commerce Appointee. Prominent Greek American businessmen and investors that spoke at the conference noticed a better climate in Greece this year, but they were very cautious to make investments at this time.